Man the winches – you boys are headed out for a sail today! There warm trade winds and clear waters of the Whitsunday group provides an incredible venue to explore on this trip. Your mount is an ex-racing yacht, an absolute beauty, capable of showing you how a true thoroughbred yacht is meant to feel under a press of sail! Explore these incredible islands and have fun doing it! You will climb aboard this yacht in Airlie Beach, to head across the Whitsunday Passage and in to the heart of this amazing archipelago. 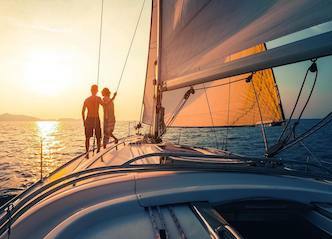 From here, you are going to enjoy some incredible views and beaches, some swims in the warm blue waters, and the feel of this beautiful yacht under sail. This world-class destination is yours for the enjoying, so slap on a layer of sunscreen and get ready. 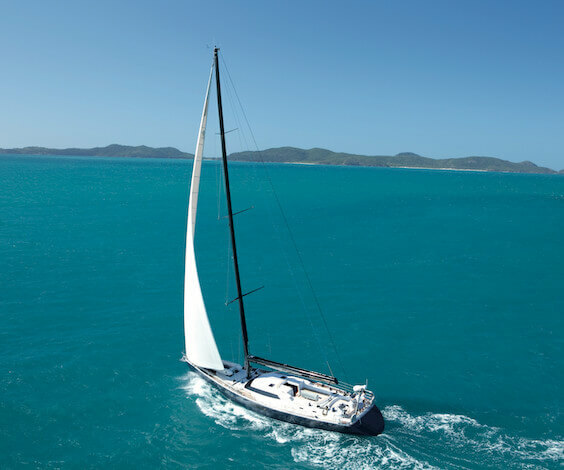 The Whitsundays are best experienced under sail. Without a noisy engine to distract you, you can experience these islands the way you are meant to! Sunset, spent swinging at anchor, is an ideal time to break out a drink and sit topdecks with the boys. The evening scenery is just as gorgeous as that of the daytime! Hop overboard! The water here is warm, and the scenery underwater is lovely. Check with your crew, there are some great spots for a snorkel! Ever wanted to learn how to sail? Ask the crew for some of their secrets, and you will be a seasoned veteran in no time! After your sailing experience, take this energy in to the town. Airlie Beach packs a mean nightlife in to its main strip, and it is time to boogie! So your Buck has decided to walk the plank? Good for him, and good for you for choosing Airlie Beach for your Bucks party. This spot has all the ingredients for an absolutely killer experience – and you wouldn’t want your Buck to head to the altar with regrets, now would you? Wicked Bucks has been organising Bucks parties here for many years, and it has long been a favourite town of ours. The combination of an absolutely killer climate and some amazing scenery, coupled with a great party scene, means you can pick and choose your party experience to suit you perfectly. So what is on the table? That depends on your goals for this mission. Keen to scare some sense in to your Buck? Why not make him jump out of a plane? Once he stops shaking, we think he will probably be grateful for the experience. Probably. Skydiving could be on the table for this particular trip, ask your party planner about it! Have you spent some time amid the Whitsundays group? These incredible islands are protected by a national park, but still provide the chance to party it up a bit. Take an excursion to Day Dream or Hamilton Island, and party in paradise! Keen to chase some denizens of the deep? The waters off this coast, both inshore and offshore, provide some outstanding opportunities. We have found for you a renowned charter captain, keep to show you his hot spots! Get on board! What about some local flavour? This area on the Queensland coast provides some of the tastiest rum to be found anywhere, and you are welcome to imbibe some of the very freshest stuff at this awesome rum tasting, just outside of town. With Wicked Bucks, you can find the variety that you need to create an amazing Bucks party for you and the lads to enjoy here in Airlie Beach. Contact one of our party coordinators, and let us make it happen for you!